I design websites to meet the goals my clients want to achieve. Some would like to use their sites to connect with their audiences in a meaningful way, some want to increase sales, some want to display their talents—but whatever the goal, each has a custom path to follow. Your website should be just as unique as you are and it should also help you achieve your goals. Contact me to make it happen. BioSpirit is a longtime client of mine. The website for the spa has undergone several redesigns to keep it looking current. 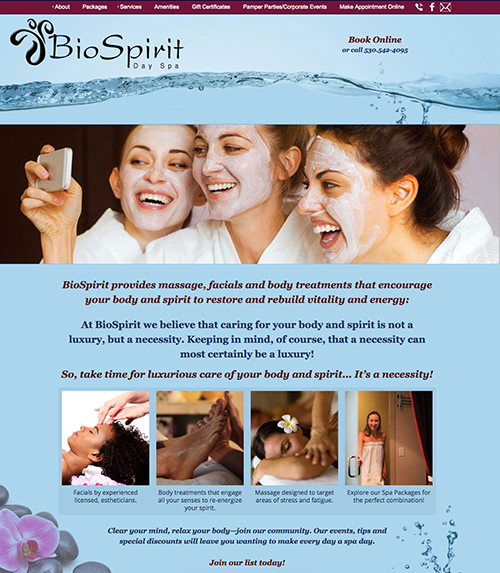 I do regular search engine optimization (SEO) for BioSpirit and it really shows in the number of people that come to their Tahoe spa from initially going to their website. BioSpirit's dedication to being the best they can be is inspiring. 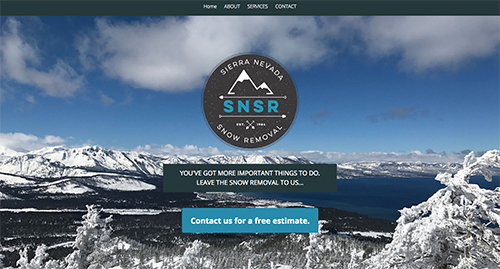 New to my family of clients is Sierra Nevada Snow Removal. This business has been around since the '80s, but has never had a website. It was time to develop an online presence and look at new ways to market, including attention to search engine optimization. As the business becomes more visible online, it will also have more value. 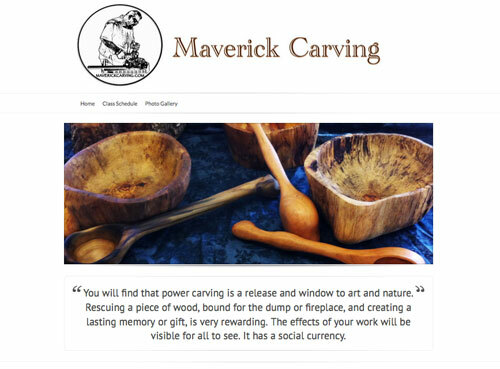 Maverick Jaillet is new to the website scene, but like many clients before him who were also new to the process, he warmed up to it and put together some great content. It was my job to make the content accessible to his visitors through a design that also showcased the beautiful work he and his students create. Now information about the workshops he teaches in many different locations is available in one place—making life easier for his students and easier for him. Rock House Discount Ski and Snowboard Rentals has been a pleasure to work with. They are determined to make their business the best and that included redesigning their outdated site and putting a lot of energy into SEO. The changes have made a big difference and their attention to excellence is inspiring. 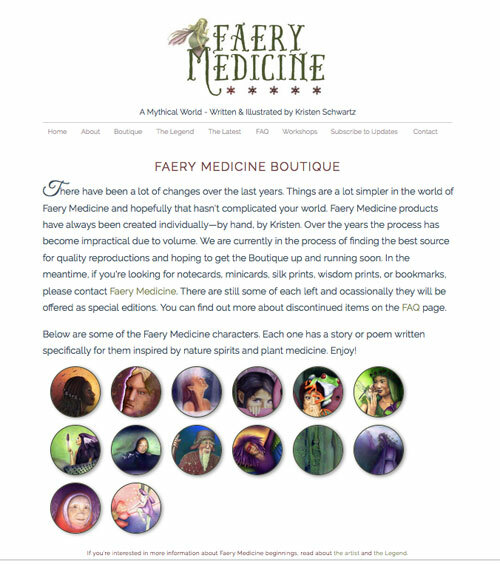 Faery Medicine is a longtime personal project of mine featuring illustrations from the world of nature spirits. The site has gone through many changes over the 13 years it has been around! 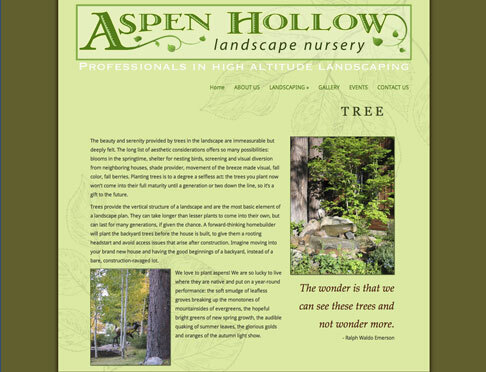 Aspen Hollow needed a website to reflect their landscaping philosophy and design aesthetics. They also needed the ability to update it themselves to keep their customers filled in on their weekly gardening events. The answer was a customized Wordpress site with photo gallery. The site is responsive to whatever device it is being viewed on and Aspen Hollow can expand functionality as needed. 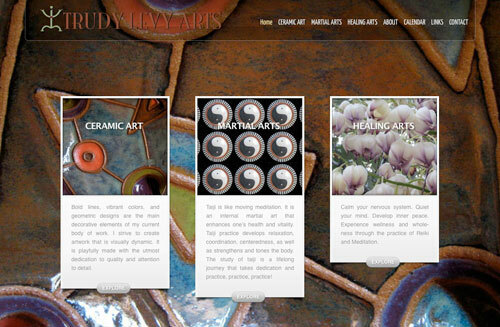 Trudy Levy Arts needed a logo and a website that could house her three specialties — ceramics, Taiji and Reiki because having three separate websites was not an option for her budget or her busy life. She also wanted to be able to add photos and edit text herself. The answer was a hosted WordPress site. After listening to what she wanted I customized functionality and design to get the look and feel she was going for. This site can be easily expanded to have more image galleries, a blog and can accommodate eCommerce when she's ready. 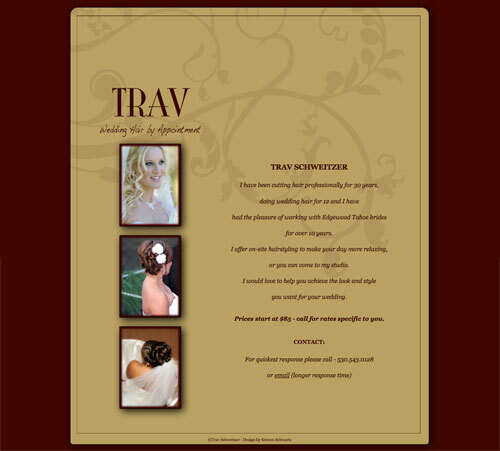 The ability to expand her site so it could grow with her business was an important aspect of this project. 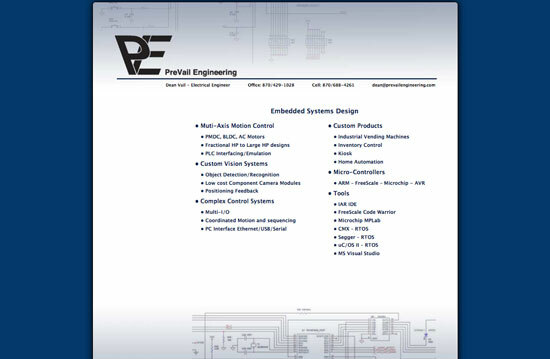 This is a very simple one page site intended to provide clients with a way to get in touch with PreVail Engineering. After setting everything up, they realized they were too busy to take on new clients. Rather than turn clients away, they decided to wait to launch the site. Stay tuned! Determined to bust through multiple life changing events and an iffy economy, gutsy potter, Barbara Wesson needed a blogsite to convey her views and sell her pottery without the added expense of hosting costs. The solution I came up with was a custom Blogspot site with links to her shops on Etsy and Ebay and direct sales on her blogsite through Paypal. 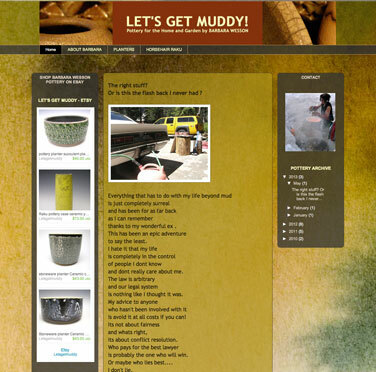 She can update anytime she needs to and the site reflects her unique personality while showcasing her beautiful pottery. Working within a world of ever changing screen sizes is challenging. It wouldn't be very practical to have a different website for every screen size and though some companies do quite well having a separate website for mobile devices, the average person doesn't need to do that. There are different ways for websites to adapt to whatever screen size they are being viewed on. This site employs a responsive design which morphs into different layouts as the screen size changes. (If you haven't already looked at how this works and you're on a desktop/laptop, grab the bottom right corner of your browser window and drag it left to watch the layout of the site change.) When I was a graphic designer for print, I always roughed out lots of designs for each project. I enjoyed looking at all the possibilities that could be had just by moving the elements around on the page. In the end, only one design could be used. I hated discarding all the rest. I think that's why I love responsive design so much. I can utilize many designs on a single page and engage the viewer in exploring the possibilities. In some respects it's a difficult way to go. The design will never be the same on screen or browser x, y and z, and it takes more time to consider the variables. Still, I enjoy this challenge and the opportunity to be more creative. The immediacy of publishing on the internet, the fluidity we can now enjoy, along with the juxtaposition of text, images and function are aspects that keep me loving the art of web design. Find out about pricing on my Design and Illustration Prices page. 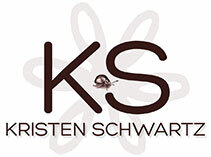 ©2007-2018 KRISTEN SCHWARTZ • HOME • Tired of reading? Drag the bottom right corner of your browser window to the left to see this responsive web design in action. No, really. It will be fun!